Last night, Peaks and Pints hosted Stoup Brewing as part of our monthly SudsPop beer education and live music event. 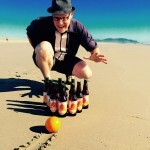 Stoup co-owner Brad Benson lecture on the science behind bittering beer, among other brewing topics. 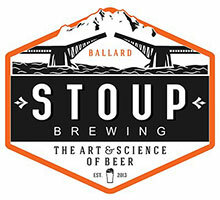 Scientist Benson and foodie Lara Zahaba opened Stoup Brewing in Seattle’s Ballard neighborhood in 2013. Washington state’s first female Cicerone, Robyn Schumacher, became Stoup’s third partner, assisting Benson in the brewing room. Benson graduated from Gonzaga University with a B.S. in Chemistry and has been crafting beer for more than 25 years. We learned Stoup produced 1,700 barrels of beer in its first year, and last year produced 6,000 barrels. It has also grown from 210 wholesale customers its first year to 500 last year. In the summer of 2017, the brewery opened “Upstairs at Stoup,” which was an 800-square-foot expansion of the 3,000-square-foot taproom and brewery to include event space upstairs. The space holds up to 40 people seated and 60 to 70 standing. This year, Stoup is expanding into a 6,000-square-foot space behind its current brewery. The expansion will allow packaging and cold storage to move out of the current production area, freeing up space for more fermenters and holding tanks to eventually triple production. Since we tapped a bunch of Stoup beers last night for our SudsPop event, let’s make Stoup today’s beer flight. Enjoy Craft Beer Crosscut 1.17.19: A Flight of Stoup Brewing. Stoup Brewing’s just released Munich Dunkel doesn’t sport any roasted character or bitter flavors, but rather this balanced beer’s signature feature is a distinct smoothness on the palate. Dark chestnut in color with a slightly sweet but delicate nose and just a hint of hops, this dunkel offers a creamy mouthfeel, caramel aroma with floral notes and a slight hop finish. A Zoigl Bier has traditions going back more than 500 years in an area of Bavaria close to the Czech border. Zoigl breweries are communal breweries that share wort with multiple brewers — then everyone fights for attention from the public to try their versions. Some Zoigl breweries are still operating today. This beer relies on German Pils and Munich malt to build a balanced malt body. Perle hops provide a traditional German noble spice character. It’s a malty lager that drinks like an ale. Stoup Brewing’s Northwest Red Ale provides a distinctly Northwest hop character balanced with a restrained malt sweetness. The brewery incorporates 2 Row along with Best Maltz Red X malts to create a rich, red color and a smooth, satisfying caramel, toffee, and earthy taste. Some pine hop backbone adds a solid bitterness. A hint of chocolate sales the deal. Stoup Brewing’s Shapka Barrel Aged Imperial Stout is a big, bold, roasty stout brewed with generous amounts of English Crystal malt and roasted barley. Hopped yet balanced with malt sweetness and a full-bodied mouthfeel. Nine months in 12-year-old Heaven Hills barrels smooths out the beer and contributes notes of wood, whiskey, and vanilla.